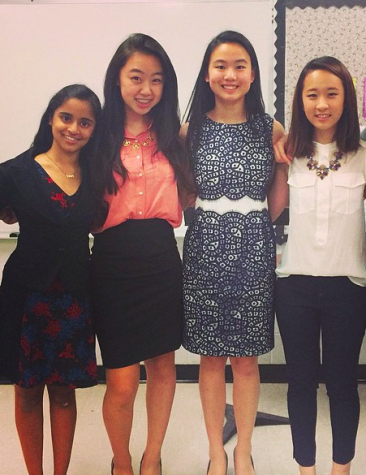 BCA’s chapter of JSA (Junior Statesmen of America) is one of its largest student organizations. Sunday, May 12th, Bergan County Academies’ Junior State of America Chapter was awarded the coveted Chapter of the Year Award by the Junior State Foundation after competing with other chapters from across the Mid-Atlantic. In addition, former BCA JSA Chapter President Maria Mendoza was honored with the MAS Statesperson of the Year Award. At the Mid-Atlantic State’s Spring State Convention, held at the Parsippany Hilton Hotel, BCA JSA proved to be one of the strongest chapters in attendance. Just by numbers, BCA JSA’s immense number of attendees correlated into a quite significant voting block and a great number of best speaker gavels. In the time leading up to the Chapter of the Year announcement, cabinet members worked tirelessly to perfect both the video presentation and the live speaking presentation to Teacher and Parent Advisors and, needless to say, it was well worth it. BCA JSA has been awarded the same award in past years, but not recently, and the unilateral feeling was satisfaction that the Chapter of the Year designation was back at BCA. These specific high level awards weren’t the only ones that BCA left Spring State with. BCA students from every grade were awarded with Best Speaker gavels for their respective debates. Considering BCA JSA’s great success due to juniors and seniors this year, it seems likely for BCA JSA to continue on this path with new leaders rising into leadership positions. Starbucks Red Cups: A War on Christmas?